Madli's shawl is coming along. Luckily I haven't gotten bored with all that orange yet. So far I have knit ten of the thirty one center pattern repeats. Not bad progress when my bare minimum goal was to finish seven repeats by the end of April. For once in my life, I'm ahead of schedule! Whenever I'm knitting from a chart, I photocopy the chart and mark up the copy rather than the original. 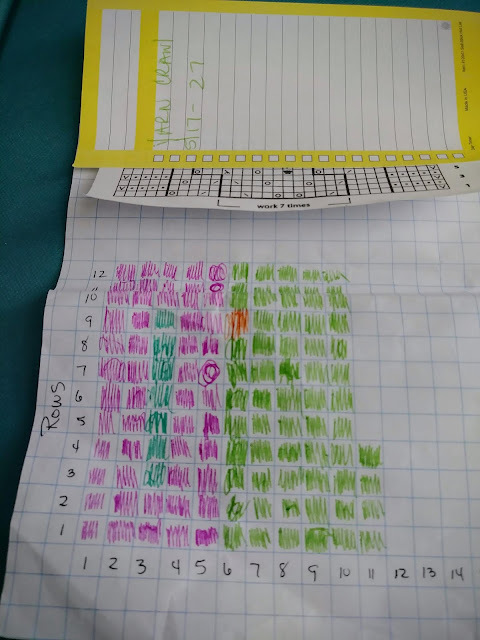 Because Madli's center chart is twelve rows repeated thirty one times, I cut out the 12 row chart and taped it to a sheet of graph paper. Then I labeled the squares one through twelve on the y-axis and one through thirty one on the x-axis. When I finish knitting a row, I scribble in the corresponding box on the graph paper. And no, the ink color means nothing. I just like colored pens and used whatever pen happened to be handy at the moment. I also stick a Post-it on the line above the one I'm knitting. The Post-it highlights the row I need to look at and allows me to see the stitches in previous rows so that I can 'read' my knitting. And, I can use the Post-it to scribble notes to myself if necessary. I know lots of knitters prefer Post-it tape but I like to use regular Post-its. Besides being cheaper, I'm a bit of a Post-it hoarder, have thousands of the pads laying around and like I said, I like being able to scribble notes to myself. By the time the Post-it looses it's stickiness, it's not uncommon for it to have multiple grocery lists, phone numbers and to-do list reminders scribbled all over them. Also, not shown in the photo, I write any special stitch instructions on the graph paper. I don't bother writing standard or common stitch symbols but in Madli's case, there's a weird little symbol for adding the bead and the first stitch of every row is slipped in an unusual way. I wrote the instructions for both of those on the graph paper so that should I set the project aside for a month or two, I could easily pick it back up without having to track down the original pattern to know what I was doing. 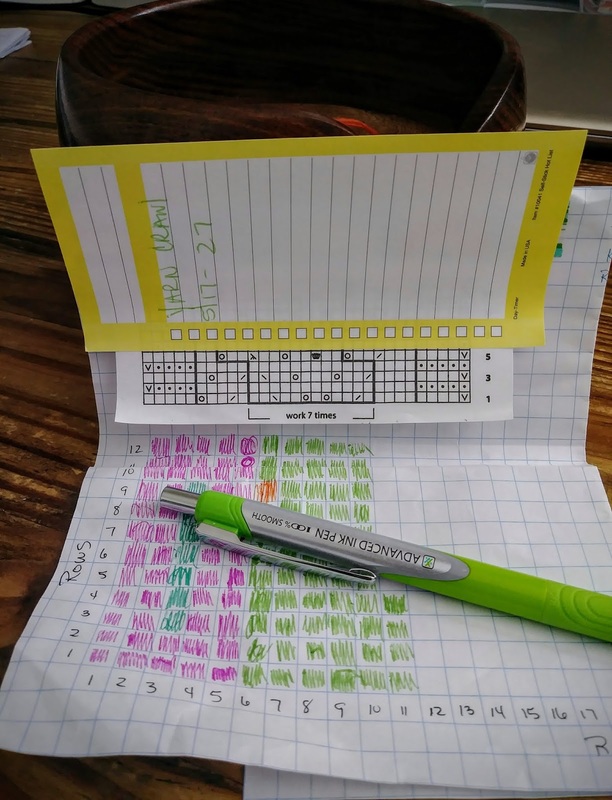 And what makes the graph paper/chart/row tracker so easy to use, I fold it in half and lean it up against my yarn bowl, computer, phone, project bag, skein of yarn or coffee cup.... The fold makes the chart stand up so that it's easier to read and the row tracker part is flat and ready to mark after each row. And because I'm weird and a collector of unnecessary things, when I'm finished knitting the shawl, I'll tape the row tracker into my knitting journal for posterity. And that's how I keep up with multi-rowed pattern repeats. Do you have an easier way? This is great! I'm a paper & pencil/pen person and keep track of regular rows that way. But love the idea of graph paper for lace projects. Thanks! The orange is so pretty! I always have to rewrite complicated patterns and re-make charts that make sense to my brain. When I do complicated colorwork I actually write out the row using the color words instead of the chart. I can read while I knit but I find a chart confuses me. That is clever! 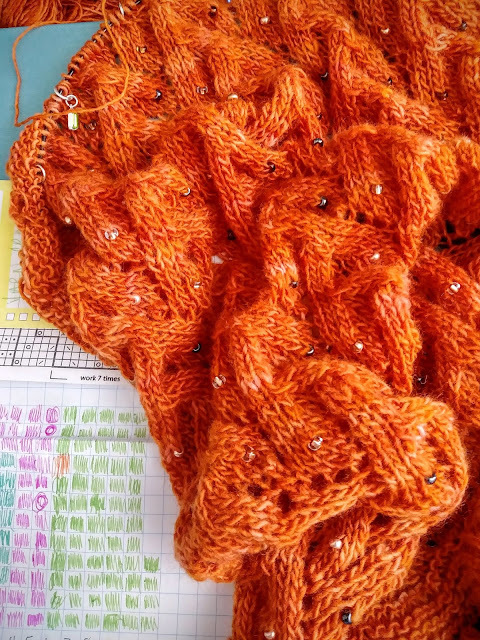 I rarely knit with charts, but I'm saving this post. love that shawl and the beads and your way of following charts.